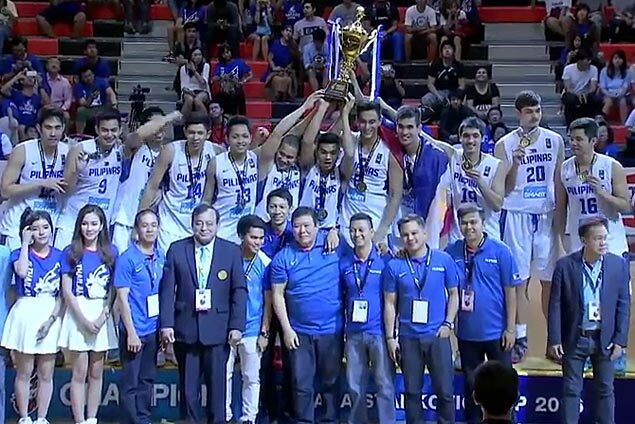 Gilas cadets celebrate atop the podium after the hard-earned win. THE Gilas cadets rediscovered their top form in time to handily beat Thailand, 97-80, on Friday and claim the 2016 Seaba Stankovic Cup at the Stadium 29 in Bangkok. Troy Rosario led six Filipino players in double figures, scoring 17 points as the Gilas cadets came out a lot sharper than they did in a one-point win over a veteran Thai squad in the elminations. The Philippines was also better from the outside, going 12-of-32 from three-point range to win the gold, just days after a tight 63-62 win over Thailand at the end of the elimination round. The gold, however, didn't come easy as the Gilas cadets had to bank on Jio Jalalon and Mac Belo in a 10-0 run to pull away from a tight 69-66 score in the fourth quarter. Jalalon had 16 points and seven rebounds, while Mac Belo chipped in 14 markers for the Gilas cadets. Samahang Basketbol ng Pilipinas (SBP) head Manny V. Pangilinan was quick to fete the bravehearts. "Well done. You played with character, pride and heart. The future of Philippine basketball in good hands," Pangilinan posted on his official Twitter account @iammvp. Also contributing significantly for the cadets was Mike Tolomia, who scored 12 points and hit a couple of clutch baskets that helped the Philippines hold on to its lead. Almond Vosotros, the other PBA player aside from Rosario in the team, finished with 11 points, while Roger Pogoy added 10 for the Gilas cadets. By finishing in the top two, the Philippines and Thailand also qualified for the Fiba Asia Challenge which will be held in September in Iran. Chitchai Ananti capped off his impressive showing for the Thailand team by leading the hosts with 19 points and six rebounds. Philippines (97) — Rosario 17, Jalalon 16, Belo 14, Tolomia 12, Vosotros 11, Pogoy 10, Ferrer 8, Escoto 6, Jose 2, Pessumal 1, Tibayan 0, Holmqvist 0. Thailand (80) — Ananti 19, Chanthachon 11, Lertmalaiporn 11, Samerjai 10, C. Klahan 9, P. Klahan 8, Jaisanuk 6, Lakhan 6, Towaroj 0, Ghogar 0, Apiromvilaichai 0.